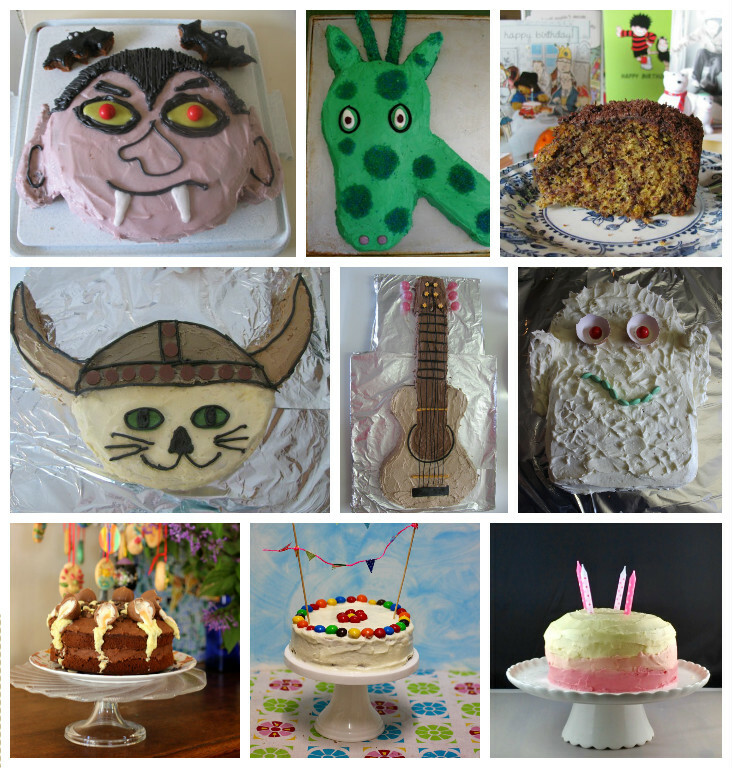 Another birthday has come around for E and with it comes my 10th blog anniversary. That is a lot of blog posts; 1921 posts, to be precise! A lot of good food, good company and continuous learning. 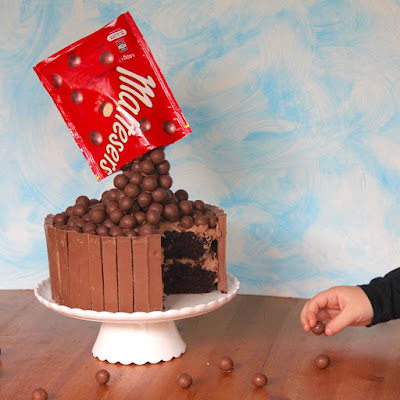 It calls for some indulgent reflections before telling you about the floating Malteser birthday cake that E shares with my blog. Let's start at the beginning (a very good place to start). When I started, blogging was often about navel gazing. I initially intended my blog to be a recipe notebook. I didn't really expect anyone to read it. Though my blog has expanded far beyond that, I still love having this place to make recipe notes and often refer back to my blog (thank goodness for the index). It is busy work. To get a post up, I am a planner, a recipe developer, a cook, a taster, a photographer, a writer, an editor, a publisher and even occasionally a web developer. No wonder sometimes I am amazed I have lasted this long. Life is contantly busy and I have seen many bloggers come and go. Yet I still love blogging and am glad I can continue to do it. I was lucky in my early days of blogging to find a friendly and supportive community online. I've hosted blog events, joined in memes, discussed copyright, reviewed cookbooks, and learnt a lot about web content management. And I have met up with bloggers for lots of delicious food. Unfortunately this seems less of a part of blogging these days. And after 10 years I am sad that I am finding less time to respond to comments on my blog, though I still comment on other blogs. However I remain indebted to the online community for so many opportunities to learn and share. Nowadays blogging is a different and more professional world. I started my blog before the social media sink hole opened up, before vlogging was an option, and when substance was more important than style. Now a blogger is expected to have style, write for a larger audience, and use multiple social media platforms. Sponsorship has replaced a lot of the advertising money. Companies fly bloggers around the world and give all sorts of freebies in return for a good word online. Mainstream media is now warily embracing blogging as a source of content. Even I have had some exposure - my blog has made its way onto Disney, Buzzfeed, Huffington Post, The Guardian and Readers Digest websites. 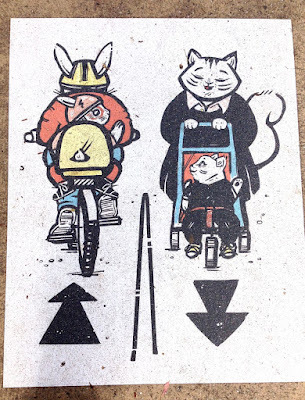 The blog has seem some of the joys and challenges that reflect my life, Aussie foods, visiting farmers markets, getting to know my sourdough starter, exploring food history, feeding a young child, learning to love nutritional yeast flakes, discovering aquafaba, celebrating local street art, using my high speed blender and recording what we are listening to on the stereo. Personally I have had huge changes to my life since starting my blog. I have given birth, acquired a hand model (aka a daughter), attended funerals, changed jobs, travelled, started wearing glasses, made changes to my kitchen, had my car stolen, made new friends, bought my first smart phone, joined a book club, opened social media accounts, bought two DSLR cameras, and so much more that it is too hard to remember and list everything. 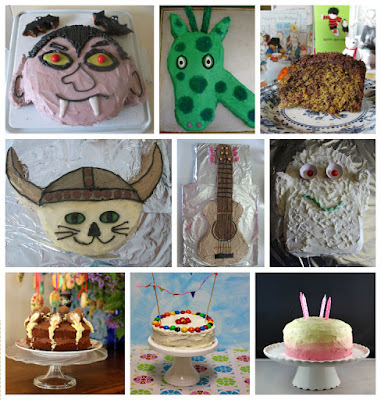 My blog began with a vampire birthday cake for my husband, E. Above you can see previous birthday cakes I have made for E since I have started blogging. Every year he now shares his birthday cake with my blog. You might notice that the cakes have become a little more grown up. 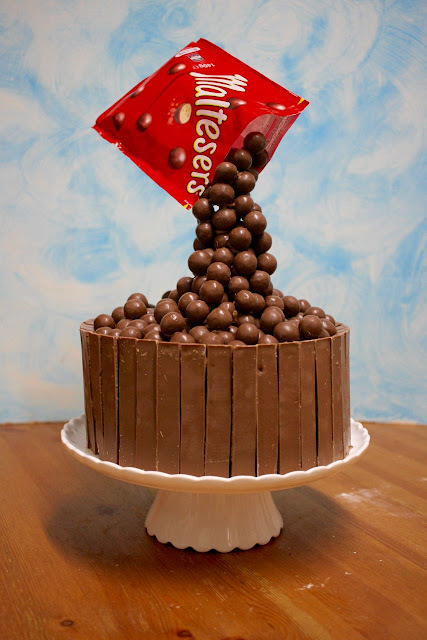 This year for my blog's 10th anniversary, I decided to make a Floating Malteser Cake. It was a lot of work. Once it was done I kept admiring it and feeling amazed that I made it myself. The cake presented quite a few challenges. Firstly I decided I needed a tall cake. This meant a layer cake. And these have not always worked for me in the past. I made a big bowl of Fudge Buttercream Icing. A brilliant marriage of buttercream icing and melted chocolate. I was impressed with how fudgy it tasted. Once on the cake it was really sweet, albeit the right colour for the Maltesers. While I iced the cake, Sylvia and her friend cocnetrated on making a little house outside for an injured baby mouse they found. I had told Sylvia she could help make the cake so I suggested they help me to put Kit Kats around the side of the cake. Unfortunately after they had enthusiastically ripped the packaging off all 12 Kat Kat snack packs that I bought in a bag, we found that not all Kit Kats are the same length. We set off to the supermarket for more Kit Kats I had bought and to return Sylvia's friend to her dad who was also shopping. 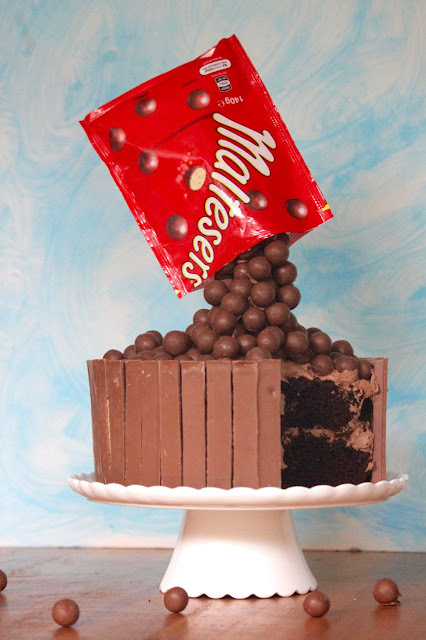 It really made a difference having Kit Kats that came up over the edge of the cake. I then had to arrange the Maltesers and the packet to look like it was gravity defying as it poured Maltesers onto the cake. This was not as easy as it looked. 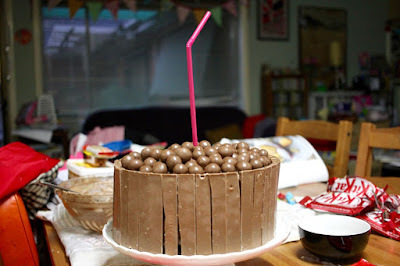 First I poured in Maltesers around the straw (strengthened by a skewer inside). Then I used melted chocolate to stick the Maltesers with a straw. I found that this was much easier if the chocolate was almost cooled so it didn't take long to set. I also used melted chocolate to glue some of the Maltesers in place that weren't sitting in the frosting but piled above it. Once done, I was really pleased with my work. It is the sort of cake I never thought I would make and wonder if I would have if not for blogging. It is a totally impractical cake. It is so tall and fragile that is hard to transport, hard to cut and hard to store. I was glad we ate it at home. On E's birthday we just had a quiet night in. We had vegan fish and chips from Kristy Turner's But I Could Never Go Vegan for dinner. Then I had to work out how to cut the cake. We were pretty full so I cut some small pieces. Actually Sylvia helped. Then I left it overnight so I could take photos in the morning. On the evening of E's birthday it rained so hard that even during the late afternoon, it was hard to find any decent natural light. When reflecting on my blog history, one of the changes is photography. My photos have improved. I have had quite a few cameras since starting the blog and now use a Canon DLSR with a macro lens for most photos and use my Mac Photos software to edit. I have a light box but it is a faff to set it up so I usually hope I can find natural light. At this time of year, that is easier said than done for evening meals. You can compare the difference between our kitchen fluorescent light (above photo) and the light through the window (below photo). Sometimes I think I should have started my blog in the middle of summer with longer hours of sunlight. You might also notice that the Malteser packet is lower in the above photo. This is quite a fragile cake. It doesn't take much to knock the packet off the straw and I found it hardest to stick the Maltesers up in the mouth of the packet. When photographing in the morning, the packet started to flap about of its own accord. I had used a little sticky tape to secure this. I carefully took off the tape and just propped it on the Maltesers. I think it looks slightly less magic but is still impressive. The Saturday after E's birthday, we took some cake and met up with my dad, my brother and many of Sylvia's cousins after gymnastics. The 11 of us took the train to Bendigo to see the House of Mirrors installation at the art gallery. Mirrors were set up as a maze in such a clever way it was hard to tell the difference between reality and reflection. 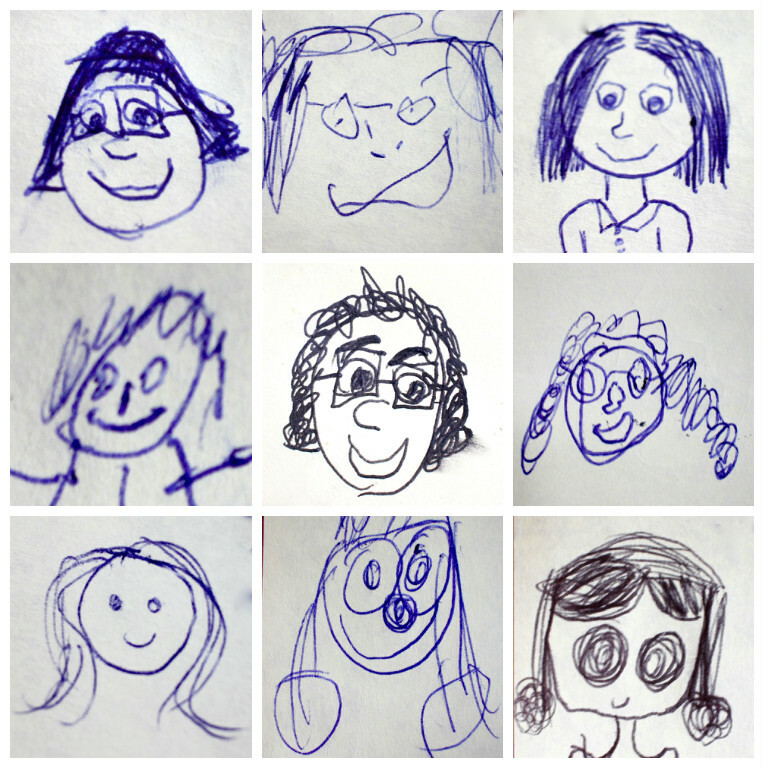 On the train home, when we were entertaining the kids, I asked everyone to draw a picture of me. 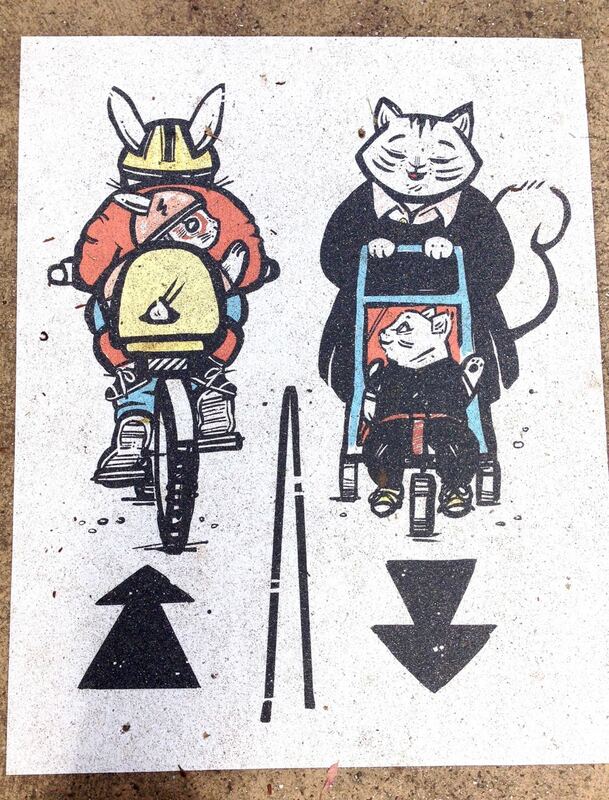 Above is a selection of their artwork. If you want to know more about my blog, check out the menu at the top of the page for indexes, lists and kitchen notes. Put one chocolate cake on a cake stand. Cover top with the icing. Top with the second chocolate cake. Cover top and sides with icing. Break Kit Kats into fingers. 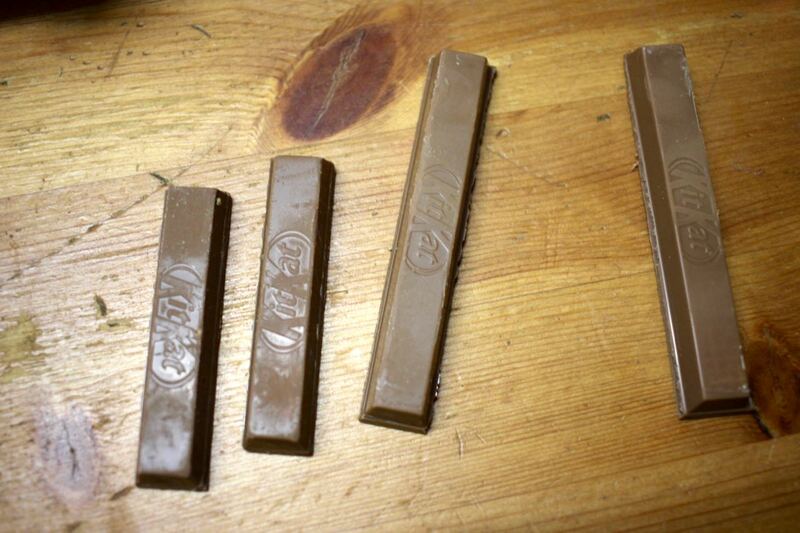 Place fingers upright and side by side around the outside (Kit Kat writing on top facing inwards). When you get to the bendy bit of the straw, you can sticky tape a Malteser bag to the straw, positioning it so that the open mouth of the bag is facing downwards. Carefully use tape to stick the Malteser balls inside the packet so that it looks like they are being poured out of it. (Alternatively you can stick the balls on the bent section of the straw at the top and then use chocolate to stick the packet to the Maltesers). Once you have finished, add more Malteserts to the top of the cake or the ones around the straw to shape it nicely. If you add them to the top of the cake and they are not touching the icing, I suggest some melted chocolate to stop them moving about if you move the cake. Preheat oven to 180 C. Grease and line 2 x 20cm round cake tins. 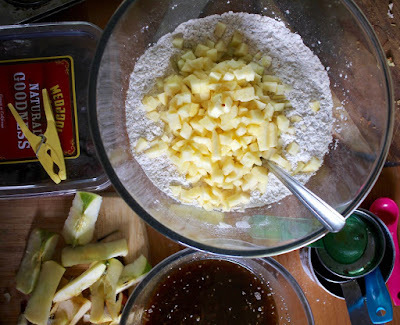 Mix dry ingredients and then add wet ingredients. Bake for 30 to 35 minutes or until a skewer inserted in the middle comes out clean. Cool on a wire rack. Melt chocolate and set aside. Cream butter and icing sugar. (I used margarine so I was able to do the creaming with a spoon.) Mix in melted chocolate, cocoa and milk until smooth. *NOTES: I found the icing really soft. Next time if I use Nuttalex margarine I might not add the milk. (I used soy milk.) I made a vegan chocolate cake which I know holds its shape well. Any sturdy sponge cake or mud cake would work here. You can use different lollies than Maltesers - such as Smarties, M+Ms, Revels, Jaffas, Junior Mints, mini marshmallows, etc. Likewise you can use different sticks around the edge - chocolate fingers, chocolate mint sticks, chocolate wafer sticks etc. 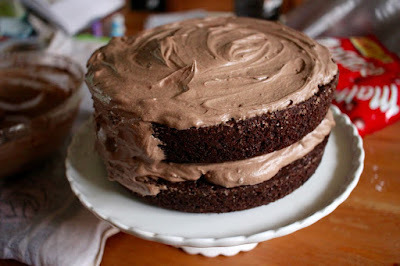 If you wanted the cake the be vegan, it would be easy to make the chocolate cake and fudge icing vegan (I think dark chocolate would work in the icing or a vegan milk chocolate). 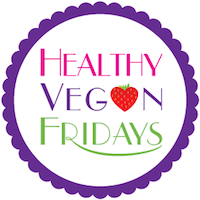 For the lollies/sweeties/candy you could use skittles, mini oreos, vegan marshmallows or health food store vegan chocolates. It was a Saturday. We had been to the Fitzroy Market (sampling amazing chocolate passionfruit cakes), the pool and the supermarket. By the time we got home, we were tired, hungry and in need of of food. 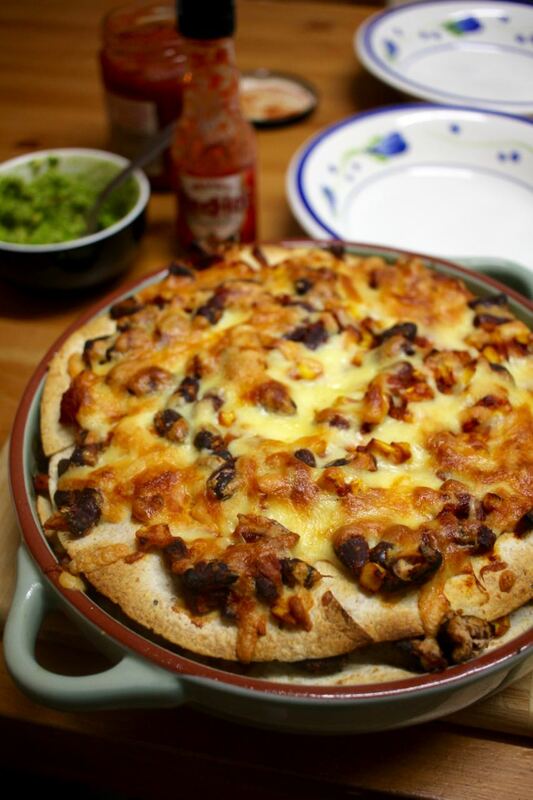 I had a packet of tortillas and wanted to use them for a casserole. 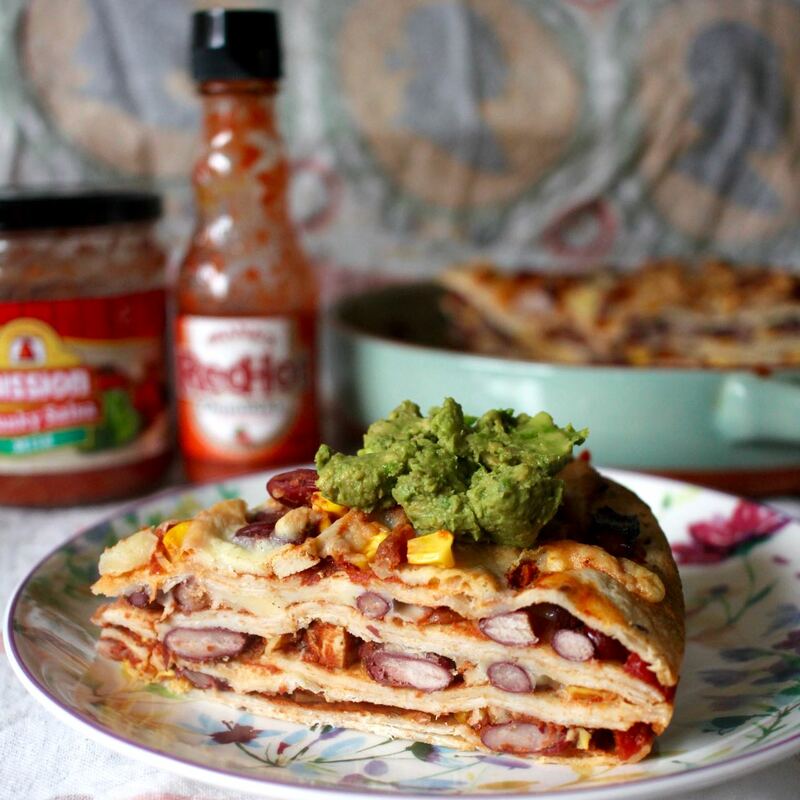 I googled an idea, found a recipe and altered it slightly. It was easy and excellent. I loved this recipe because it just required mixing everything in a bowl rather than having to cook a sauce first. Then it was a matter of popping it in the oven and collapsing on the couch in front of Brave. I didn't plan to blog it, as you might see in the above photo quickly snapped before serving. But I loved it so much that I took pictures the next day. 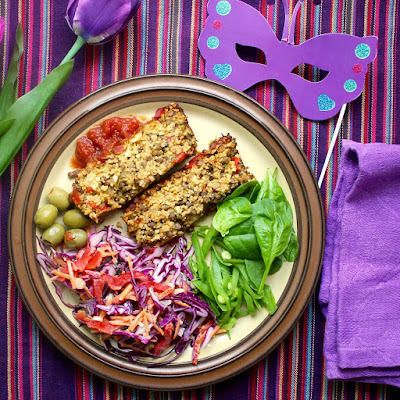 This is the sort of easy dinner recipe I need at the moment. I have less time than ever for meals. Being able to throw dinner together is fantastic. Just as good is coming home to leftovers. 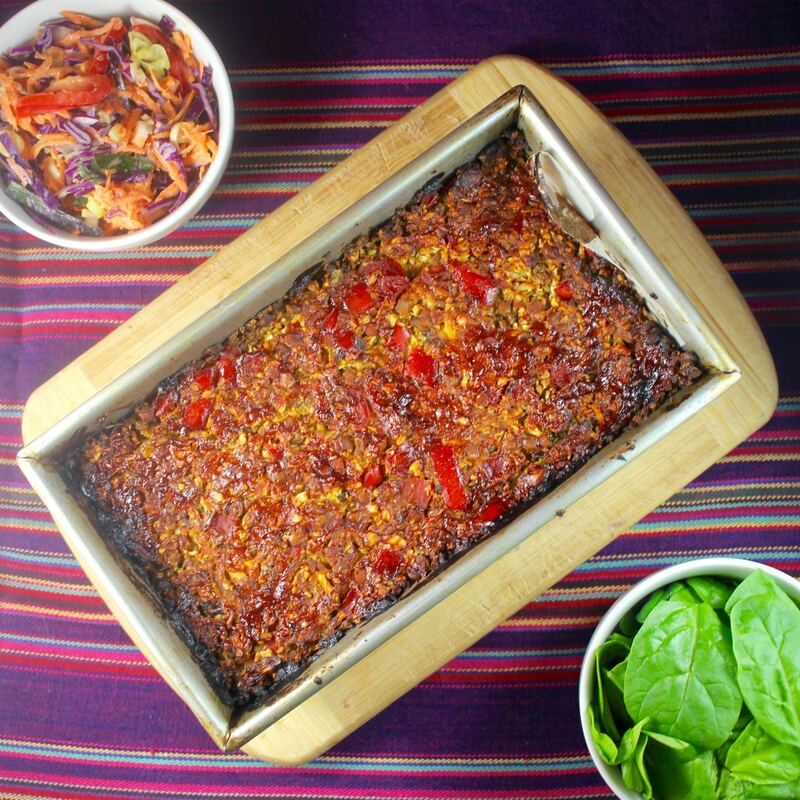 I am sending this casserole to Meat Free Mondays. Preheat oven to 200 C* and grease a 23cm round casserole dish. 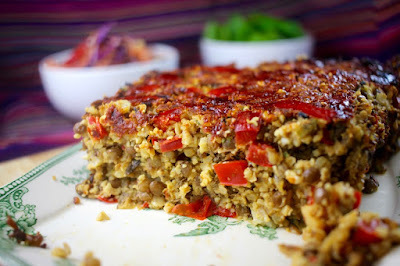 Mix beans, lentils, tomatoes, corn kernels, spring onions and spices. Add hot sauce, salt and pepper to taste. Layer tortillas, the bean mixture and the cheese (2 or 3 layers) until you have the last layer of tortillas, beans and cheese (in that order). Bake for 30 minutes or until the cheese is golden and bubbling on top and the tortillas are just starting to crisp up at the edges. 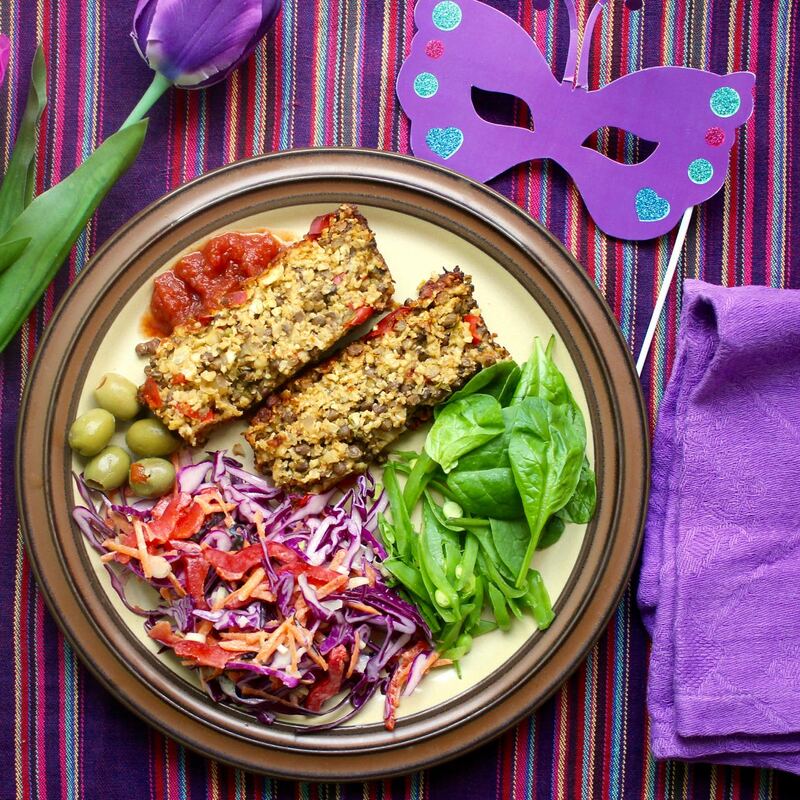 *NOTES: I didn't have a whole tin of kidney beans so I topped them up with some chopped bbq tofu. I used wheat tortillas but I am sure corn tortillas would work. I used mozzarella cheese but vegan cheese would work, except that it would be less likely to be golden and bubbly on top. I had my tortillas overlapping with one whole tortilla and then chopped another tortilla up and arranged around the whole one to fit. I baked mine at 220 C because my oven is so slow. Lately I have enjoyed baking vegan muffins. 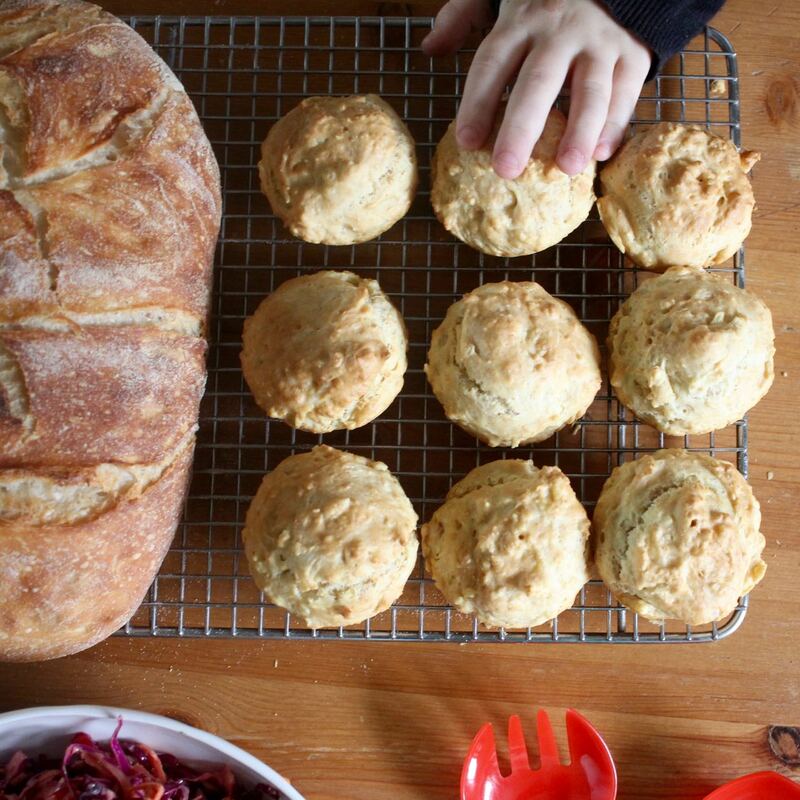 Sylvia on the other hand has been begging me to let her bake a favourite cheese and tomato muffin recipe that she made at her school kitchen garden program. As I had not had eggs on hand, I told her we could make an eggless version. Later when I had some vegan bio cheese on hand, I tried a completely vegan version and we all loved these just as much. 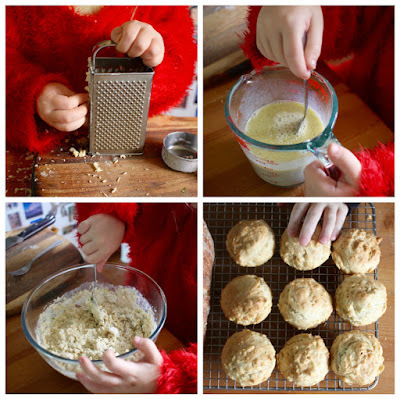 These muffins are so easy that even a child can make them. Sylvia was keen to show me she could make them. I mostly stood by. She mostly needed help with putting them in the oven. Once they were baking, I rushed off to meet a friend for brunch and left E to help her take them out of the oven. As you can see, Sylvia preferred her muffins without the little cherry tomatoes on top. I was pleased she was happy to still have parsley in them. This cheesy version was a little crispy on top. If I had been about I think I might have taken them out earlier than after 35 minutes. But they were still delicious. When I got home there weren't too many of them left. Sylvia had insisted she use dairy cheese in her muffins. Ironic as so often she does not want to eat cheese when I offer it. 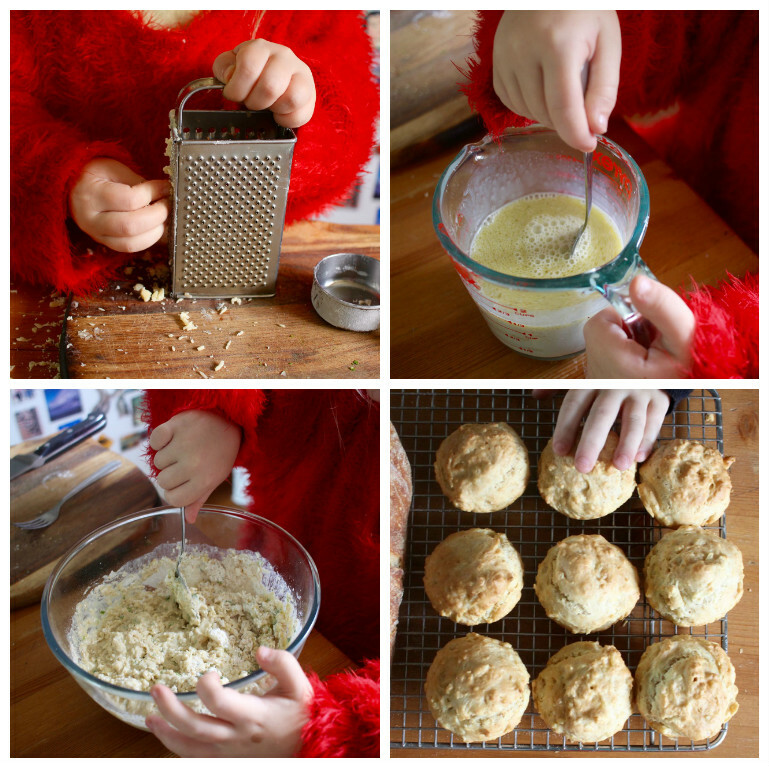 She also wanted eggs in her muffins and when she stayed with my mum, she took along the school's recipe to make. I didn't get a photo but they did look cute with cherry tomatoes on top. A week later, I had biocheese in the fridge and decided to try them again as a totally vegan recipe. Neither Sylvia or E noticed. And they didn't mind when I told them they were vegan. No one has a problem with good food. I had thought they might be good to take to school and work for lunches but they just don't last that long. I am sending these muffins to Healthy Vegan Fridays #148. 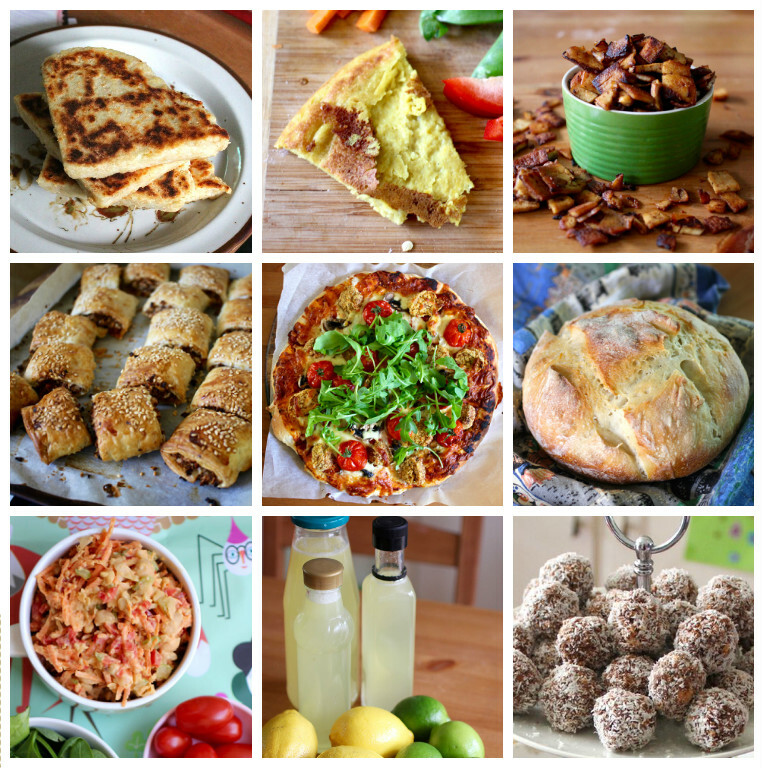 This will be the last week of one of my favourite blog events.. 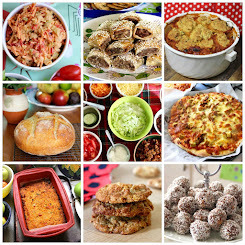 It was started in 2012 by Carrie on Vegan (now Carrie on Living), Everyday Vegan Girl and Veggie Nook. 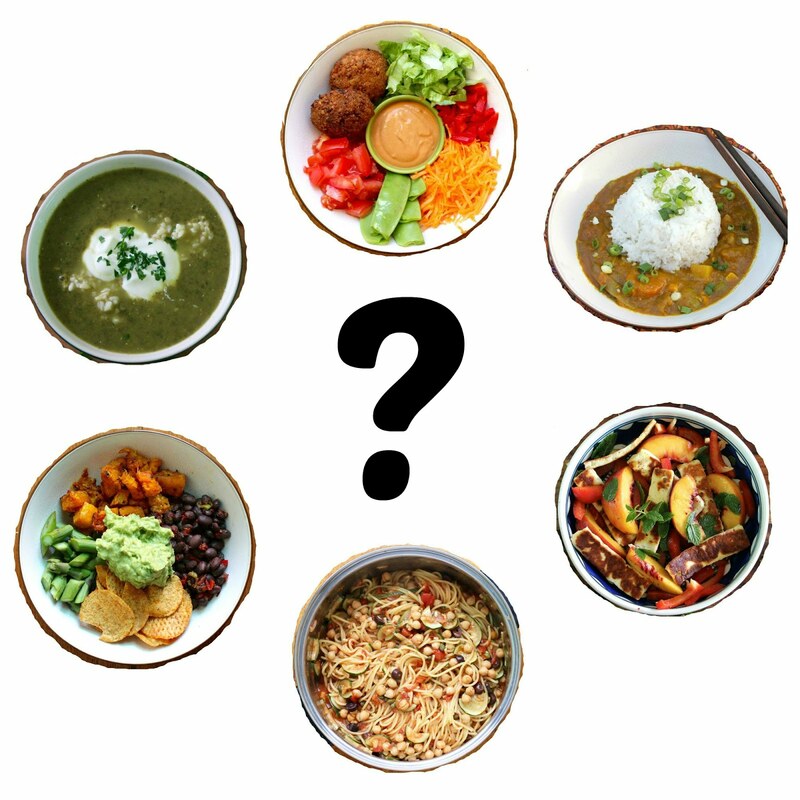 Since then it has hosted by a variety of bloggers including Green Thickies, Hello Veggy, Herbivore Triathlete, and Vegan Dollhouse. 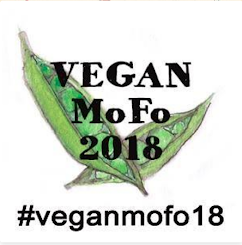 Most recently it has been hosted by Kimmy of Rock My Vegan Socks, who has hosted for over 3 years, and Mary Ellen of VNutrition. It has been a pleasure to get to know Kimmy and Mary Ellen. However bloggers change and these lovely hosts have decided to hang up their boots and call it a day. Many thanks to Kimmy and Mary Ellen for all the wonderful food they have shared; for their welcoming and generous spirits; and for all the time and work they have put into the event. I will miss the event but hope to still keep in touch. Preheat oven to 200 C and grease a 12 hole muffin tin. Mix the flours, cheese, baking powder, parsley and salt in a medium large bowl. Lightly whisk together milk and oil. Pour into the flour mixture and gently mix until combined. 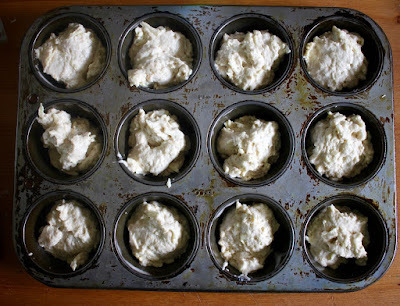 Spoon into muffin holes and smooth the tops a little (or you will get the rustic look). Bake for 20-25 minutes or until a skewer inserted in the middle comes out clean. Cool on a wire rack and store in an airtight container. Kitchen sink vegie curry and random moments. Term 2 started this week. It is hard to believe that the school holidays have whizzed by. I had even less time at home during the holidays thanks to my new job. I am lucky that my parents are always happy to help out and took Sylvia for a few days in the first week. I made a huge pot of curry that meant I could relax over leftovers for a few nights. 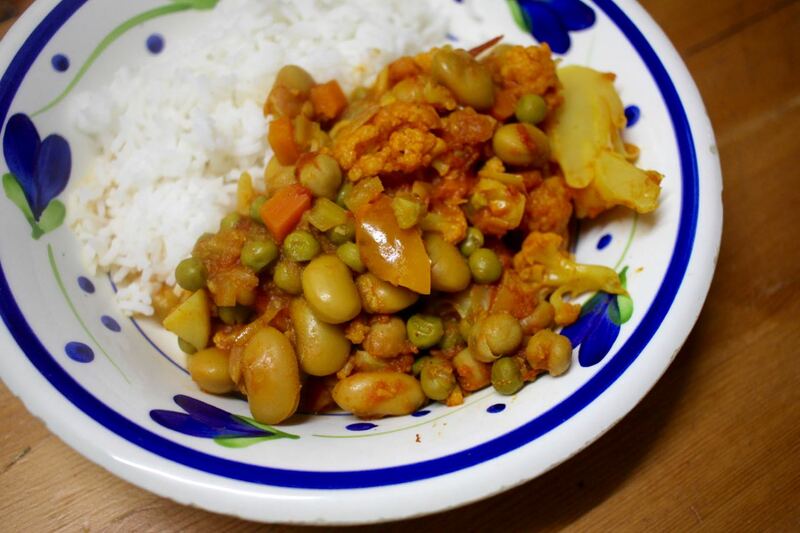 I originally planned to make a Cauliflower and Butter Bean Curry that I found in Cook Vegetarian February 2009 when cleaning up my magazines. As so often happens, I looked at the recipe, then I looked in the crisper in the fridge. I just went with my instinct rather than what was in the recipe. It was so good that I decided to blog it. After all, this is one of my basic sort of stews. 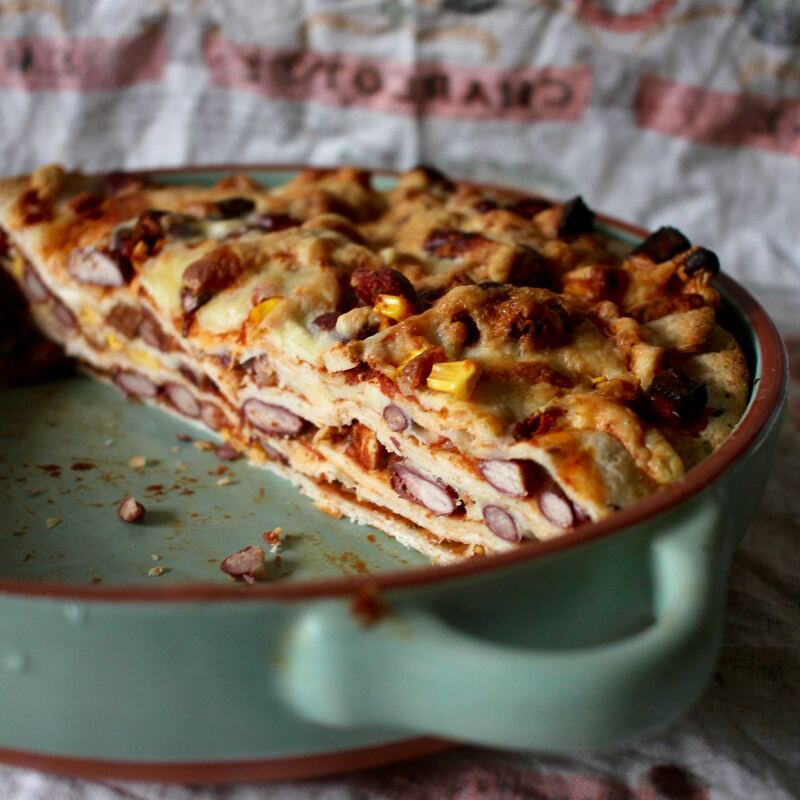 I haven't made it for ages but I am still quite surprised not to have this sort of recipe on my blog. The curry was the sort of stew I enjoyed as a child. I made this for dinners when I was first out of home and learning to cook. It is easy and comforting. I put it on and left it for E to simmer and make rice while I went out. We had this around for a few nights. It saw us through book club, a quiet night, Dave O'Neil at the Comedy Festival and a night out at the pub after work. Unfortunately I was too busy to organise to take photos in natural light. Shorter nights are not keen to food photography. Before I leave you, I have a few random moments from the holidays. Sylvia was cross with Shadow one night. Suddenly she came to me and said, we are friends again. Then she took some recipes in to discuss with our cat. I guess that is a food blogger's child's idea of being friends. I had a puncture in my bike on the way to work last week. Luckily there are a few bike shops along the bike path. I had it repaired in about 20 minutes. While the woman in the shop fixed my bike, I held her baby who had been crying. It was a strange way to start the day. We went to see Beauty and the Beast at the cinema in a shopping centre. I was so proud that we got out of the house early. I got a great car park. We were in the queue to buy tickets when I dug in my bag for my wallet. I had left it at home! So we had to drive home and back past an accident, listening to a sad story on the radio and it took so long Sylvia fell asleep. An hour later we were in the queue again and were thankful the film was showing once an hour. Heat oil in a stockpot and fry onion, carrot, celery and garlic until soft (I add these in this order as I chop them so it can be 5-15 minutes). Stir in curry powder, cumin, turmeric and mustard powder. Fry for a minute. Add remaining ingredients. Bring to the boil and cook for 20-30 minutes. Serve with rice. This is my third year making and blogging a batch of sourdough hot cross buns. Each time it seems like I have it and then the next year I want to change it up. This year I decided to simplify the steps and then got paranoid the dough wasn't rising so I left it for hours. The resulting hot cross buns were superb. They have seen us through the Easter weekend and we still have some in the freezer. 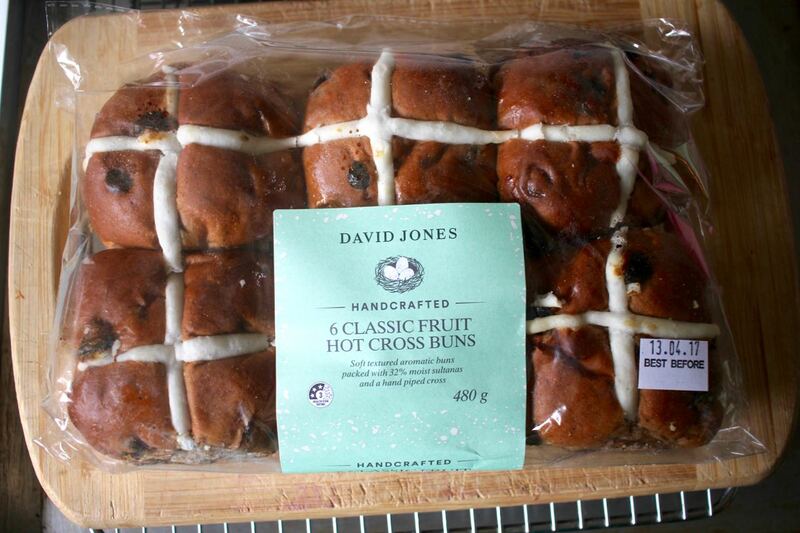 We have had a few different hot cross buns in the house. Last week on Wednesday I realised how soon Good Friday would be upon us. I happened to be in the city and so I indulged in some David Jones hot cross buns. On the same day E bought some choc chip hot cross buns from Bakers Delight. But I still felt it wasn't right not to have home made. And I had promised Sylvia we would bake some. 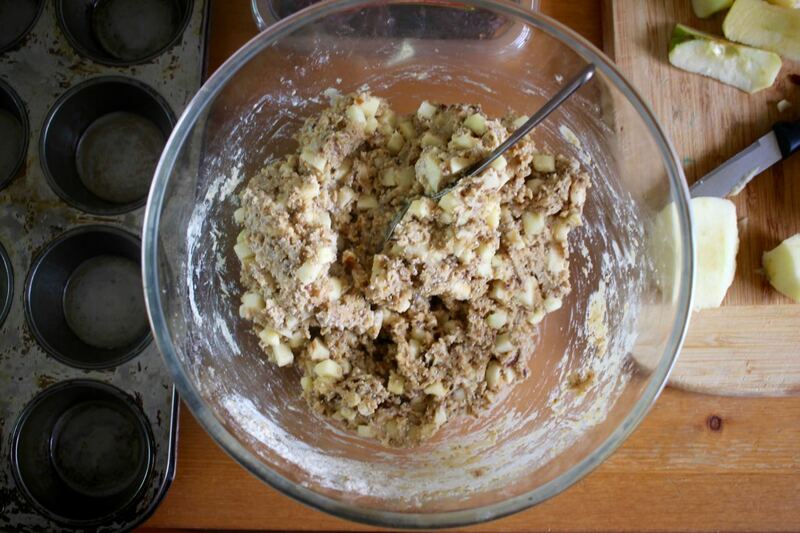 On Wednesday evening after work I set to baking a batch of yeasted hot cross buns with dried apple instead of sultanas. This is the hot cross bun recipe I have made for years and it works wonderfully. I kneaded the dough while my brother was visiting and watched it rise high above the mixing bowl. The rising was not quite as rapid as I have would have liked. The buns came out of the oven at 10 so it was a late night for Sylvia. I had promised she could help. Ah well, it was the school holidays. I enjoyed these hot cross buns but I found the dried apple a bit bland compared to the usual dried fruit I put in my buns. (For the record, I like dried peel and occasional glace cherry in my buns.) Sylvia enjoyed the plainness of the buns, though I think would have been happier with no fruit at all. That just seems wrong. I had tried to convince her to do dried apple and white chocolate but she refused. Her favourite part of the buns was the thick chewy crosses. 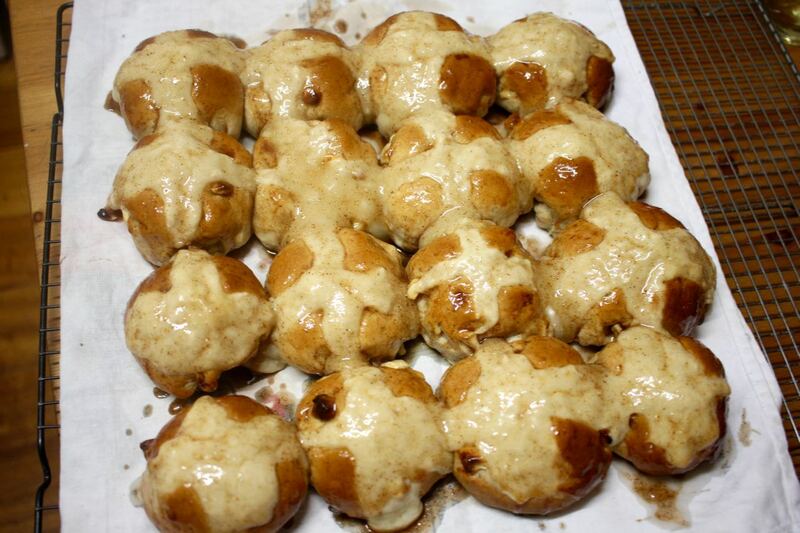 I had decided to bake another batch of hot cross buns on Good Friday (a public holiday here). I don't use a lot of dried fruit in baking. So I bought the smaller packet of Gourmet mixed fruit. 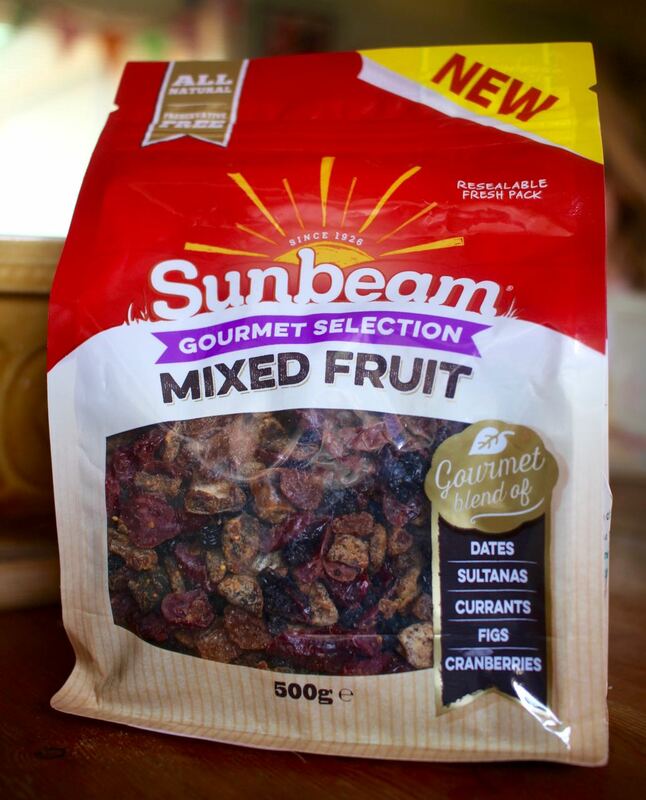 It is a mix of dates, sultanas, currants, figs and cranberries. 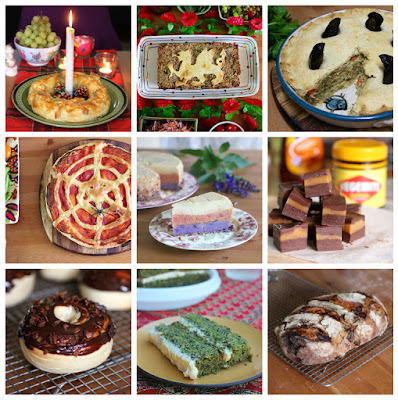 In fact Christmas and Easter are the times when I do most of my baking with dried fruit. I still had some fruit mince leftover from Christmas. It went into the hot cross bun mixture and was very pleased that it worked. 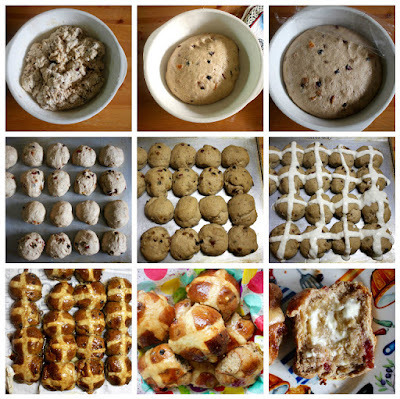 I took the sourdough hot cross buns recipe that I made last and modelled this year's recipe on it. Last year I did a vegan recipe but this year, my mum brought me eggs just for the buns and so they needed to be used. I added a mixture of fruit mince and dried fruit and tried to simply the steps in the recipe. After making yeasted hot cross buns, I was concerned that the dough wasn't rising. It didn't go over the edge of the bowl like the yeasted dough. We went out for a walk along the train line while the dough rose. I took my time but it still looked like there wasn't much lift. I think it was 6-7 hours before I divided it into buns. The result was really good. Lovely soft crumb. So perhaps next year I will just leave it overnight. All I need is the energy to knead it. And given that my usual overnight sourdough bread is no knead, perhaps I could get away with less kneading. 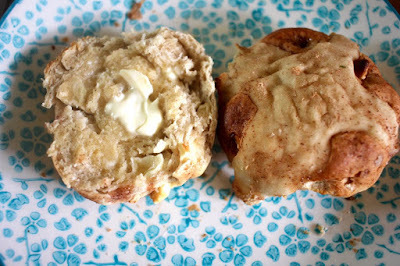 It is frustratingly slow progress on experimenting with this recipe because I don't make many hot cross buns each year. Once the hot cross buns were sorted, I could focus on other Easter activities. On Saturday morning, I met a friend at the Boot Factory who had a 10% public holiday surcharge! 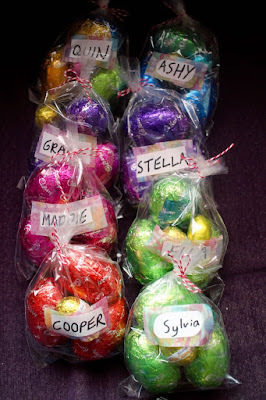 Then I bought some Easter eggs for nieces and nephews. 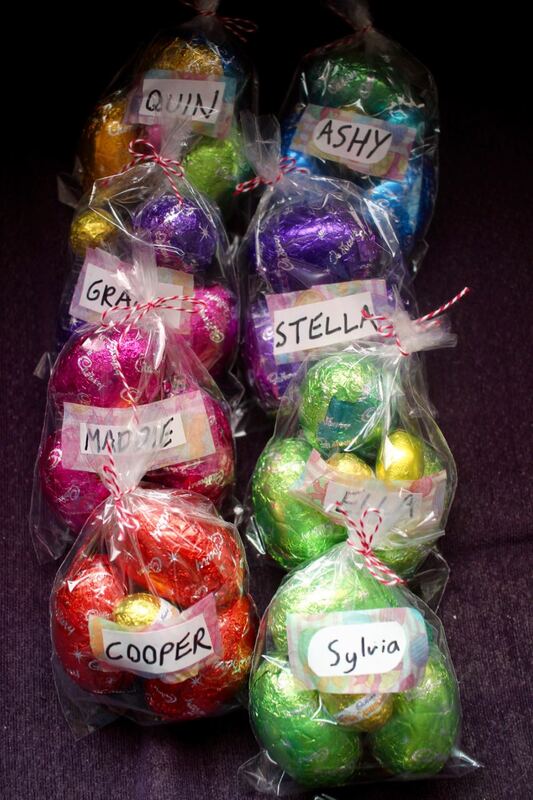 Sylvia packaged them up very nicely. She told me that she put one bag together for herself as the dummy run. We went down to my parents house where we ate beetroot and goats cheese tart. Sylvia had requested that we make Easter egg nests. I agreed but when we tried to do it at home, the chocolate seized. So we tried again at my parents' place. Sylvia asked for milk chocolate rather than dark and it was so so sweet. Surprisingly they were gone by the end of Sunday. At least we finished up the end of the packet of cornflakes. 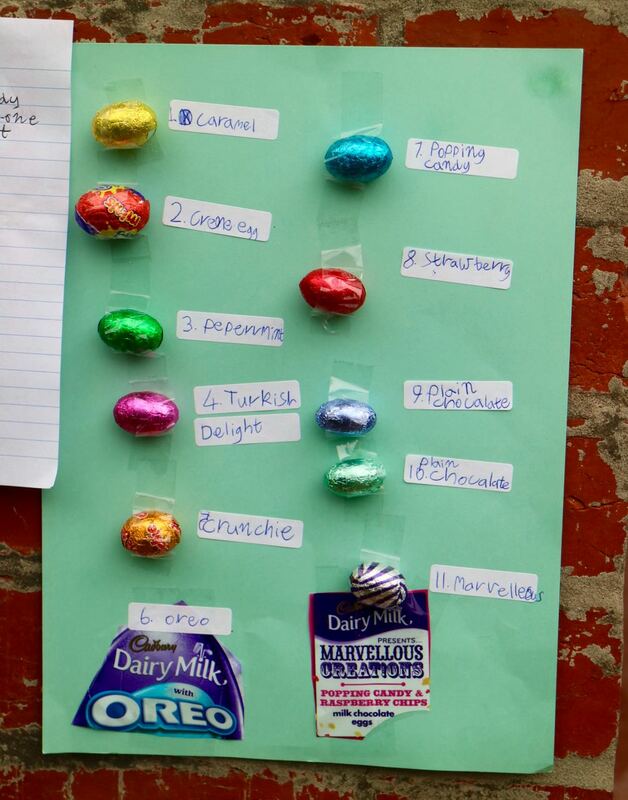 My dad loves organising the Easter egg hunt for his grandkids. This year he bought 11 different types of mini eggs and directed the kids that they were to find one of each type each. If they found more than one, they could share with others. My mum says she found quite a few eggs in the garden after last year's hunt. I think there were one or two oreo eggs left this year. 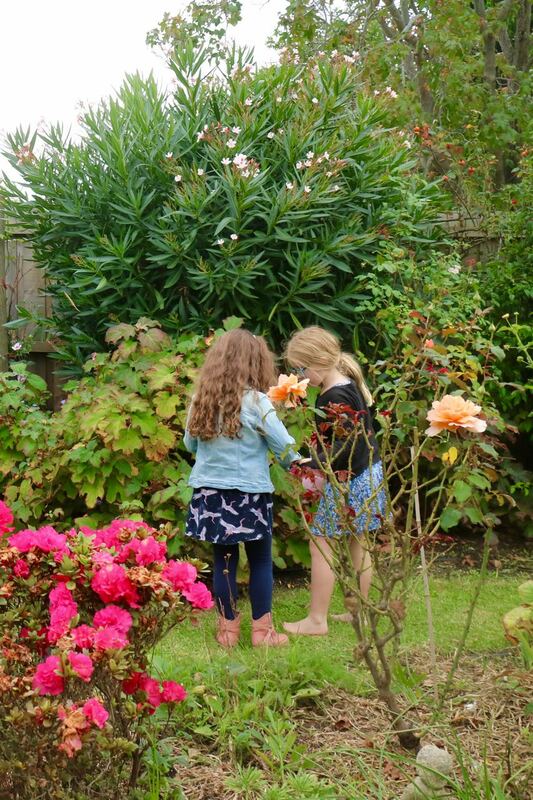 Sylvia and her cousin, Ashy, had such a great time on the Easter egg hunt that they organised a few more hunts for each other later in the afternoon when other kids had left. Before then we had an Easter Sunday roast dinner. 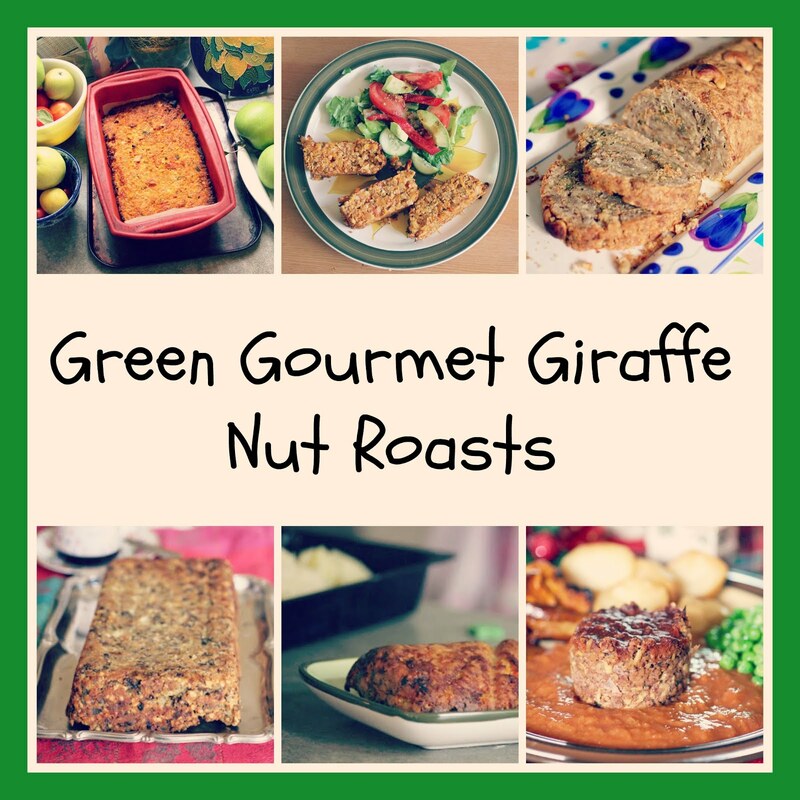 I made a nut roast, which was nice but not my best one. My mum made a lovely pumpkin, goats cheese and sage salad as well as the usual roast potatoes, cauliflower cheese and peas. 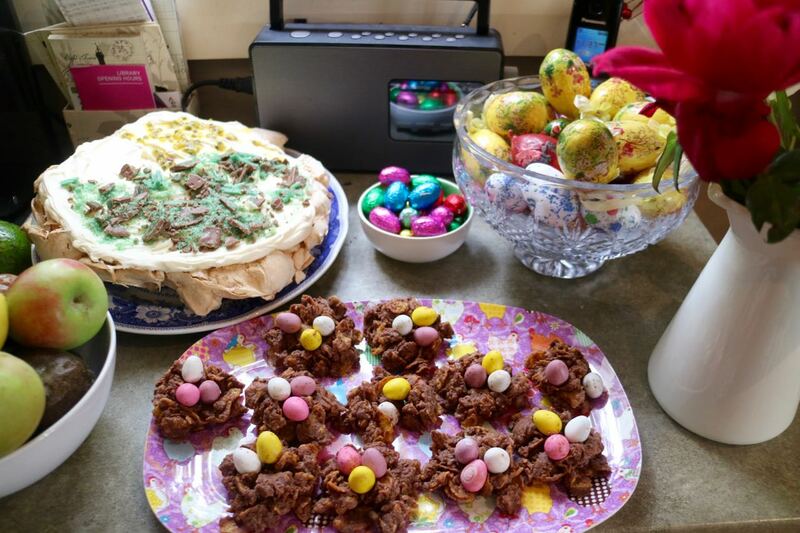 For dessert, there was pavlova, Easter egg nests, and a Creme Egg cheesecake. I had to have a slice of the cheesecake and it was lovely. Then I whiled away the afternoon with those who were left after my dad and brother headed out to the footy. I enjoyed some cups of tea, mini eggs and a hot cross bun and a trip to the garden store before driving home to watch Roald Dahl's Revolting Rhymes. A fantastic way to finish a festive weekend. 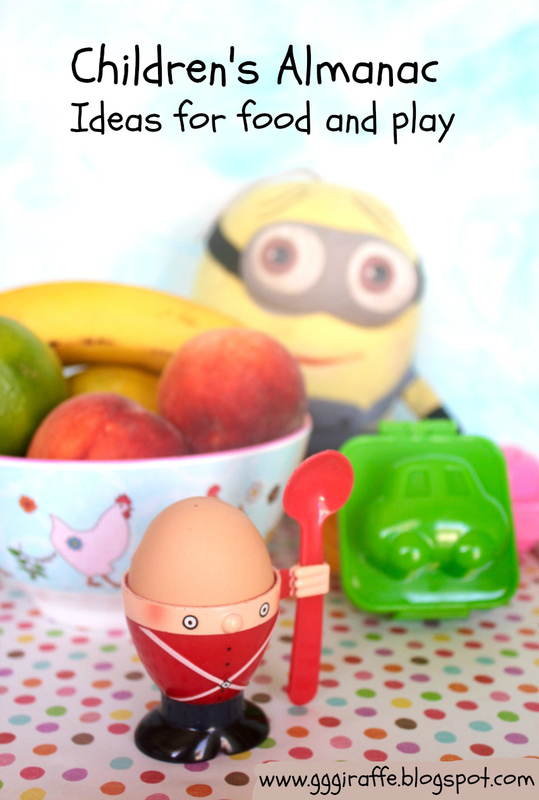 For more Easter ideas, check out my round up of Easter recipes. Rest covered for 30 minutes. Knead 10 minutes until smooth and elastic. I needed to keep flouring the board as it was quite sticky. Cover and rest 6-7 hours or overnight. It will rise but not double in size. Divide and roll dough into 20 balls. Place in baking tray. Preheat oven to 220 C about 30 minutes before baking. Mix flour and water into the paste to make crosses. Spoon paste into ziplock bag and snip tiny piece of corner. Pipe lines of paste across centres of buns to make crosses (I like them thick). 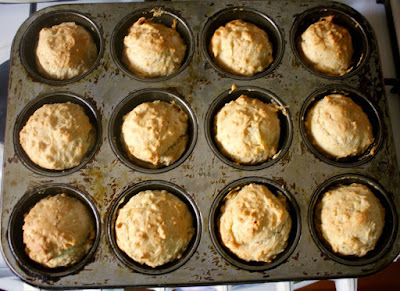 Bake 30 to 35 minutes until buns are golden brown and hollow when tapped. Five minutes before buns are cooked, simmer glaze without stirring for 5-10 minutes. 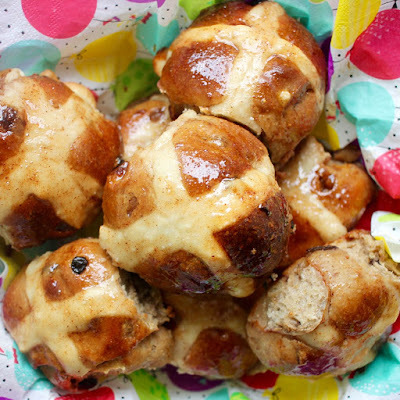 Place buns on an old teatowel on a wire rack, crosses facing up. Brush ALL glaze on hot buns. It can take a lot of brushing, depending on how long the glaze simmers. Keep in an airtight container for 2-3 days or store in the freezer. 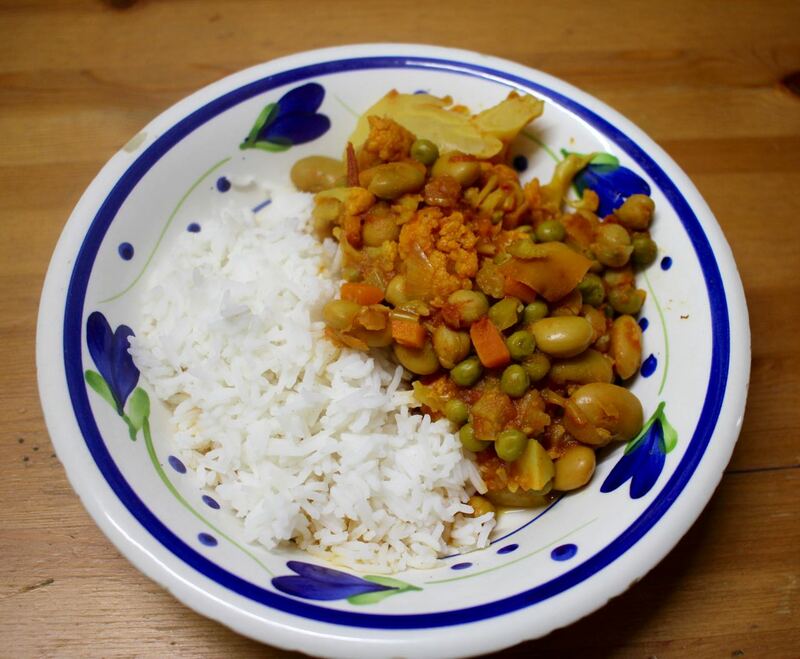 Can reheat at 180 C for 10 minutes (from room temperature) or 15 minutes (from frozen). *NOTES: to make these buns vegan like my previous batch, take out the egg and add in 1 tbsp chia seeds and 3 tbsp water., then substitute 25g each of tapioca flour and cornflour for some of the flour. I usually simmer my glaze for 2 or 3 minutes but forgot and did it for 10 minutes. It was darker and thicker but meant there was less to brush onto the hot cross buns so it was quicker. As I noted in the post, the dough does not rise nearly as much as the yeast ones I make. Also the buns take a lot longer to cook than the yeast ones. Never having liked eggs, I have often admired how pretty they are in certain recipes. Such as a Scotch Egg. I can't imagine I will ever eat a traditional one made with minced meat around hard boiled eggs. 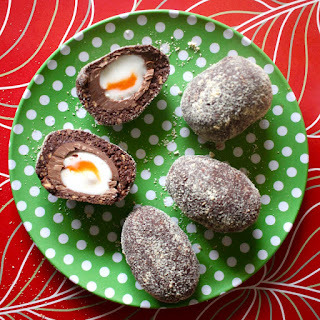 So when I saw Lorraine making a chocolate version with a Creme Egg, I could not get the idea out of my head. Finally a chance to eat Scotch eggs, albeit with chocolate. 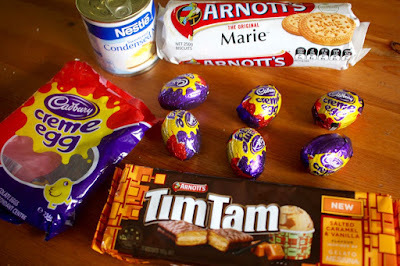 Lorraine used Tim Tams and cream cheese for the "meat" around her creme eggs. I just could not get the idea of using the mixture of my favourite grubs. However I knew it would be sweeter because they have condensed milk. I decided to use a salted caramel and vanilla Tim Tam instead of the usual Marie Biscuits. In future I might use regular chocolate Tim Tams. I think the vanilla was not my cuppa tea. Instead I tried to reduce the sweetness of the "meat" by adding more cocoa and some salt. Getting the "meat" around the egg was quite challenging. We struggled to get the right egg shape and one or two eggs cracked as we tried to coat them. (I guess this is also hard with the traditional meat Scotch Eggs!) We also used condensed milk that was past the best before date. It was edible but quite thick. Not ideal. I used Marie Biscuits for the "breadcrumb coating". But I think they were ground too finely in the blender and were more of a powder than a crunchy coating like Lorraine's. And that powder got all over the kitchen. I try to contain my mess when cooking but when I have help from my 8 year old, it does tend to spread. It didn't help that I put the crumbs in a small bowl. I think 10 biscuits was too much. Sylvia had a lovely time making these with me yesterday. (And being my hand model!) Which was just as well. I had promised her a baking day but it went awry. The hot cross buns took ages to rise, we ran out of butter and when I tried to do chocolate for another treat, it seized in the microwave. And on Good Friday, the shops aren't open to nip out and buy more. E enjoyed helping us eat them. He is quite a fan of Cadbury Creme Eggs. It was a fun Easter project but one I am unlikely to repeat. 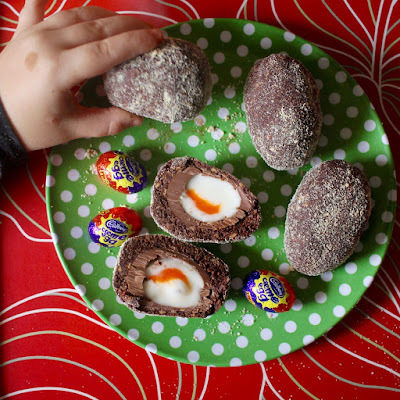 I find Creme Eggs rather sweet and with the coating it was just sweet on sweet. When I was amused to make them, I would prefer more chocolate and less fondant. Eating a whole of these Scotch Eggs is rather overwhelming. I found myself cutting them into small slices. And that just does not seem cricket when it comes to Scotch Eggs. But then again, neither is chocolate! I am sending these to Choclette for We Should Cocoa. 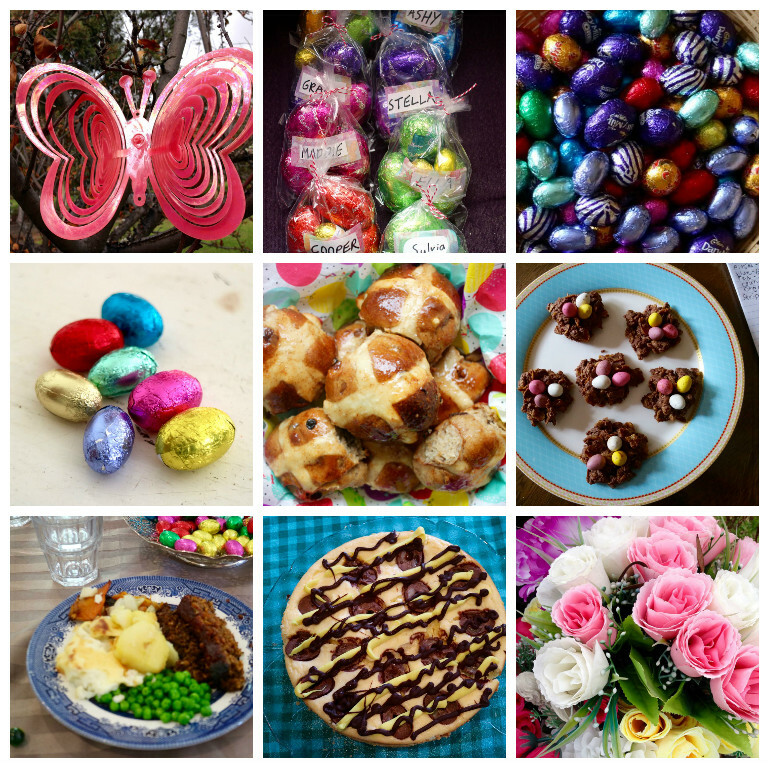 For more Easter ideas, go to my Easter Recipes round up. 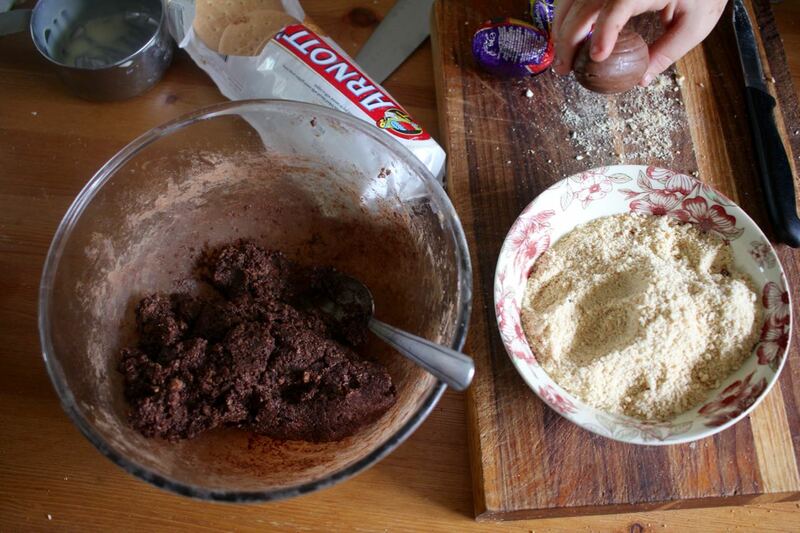 Unwrap Creme Eggs and blend Marie biscuits to coarse crumbs. Put the biscuit crumbs in a shallow bowl. 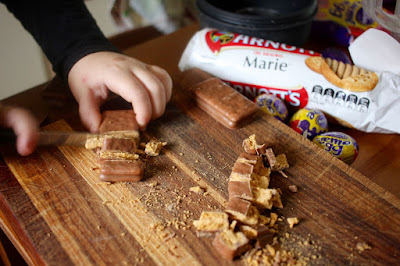 Whiz up Tim Tams in blender til crumbs. A bit of texture is good. Mix with condensed milk, coconut, cocoa and salt. Divide the mixture into six parts and press one sixth around one Creme Egg with your hands and shape into egg shapes. Roll in Marie biscuit crumbs. Eat in small amounts. 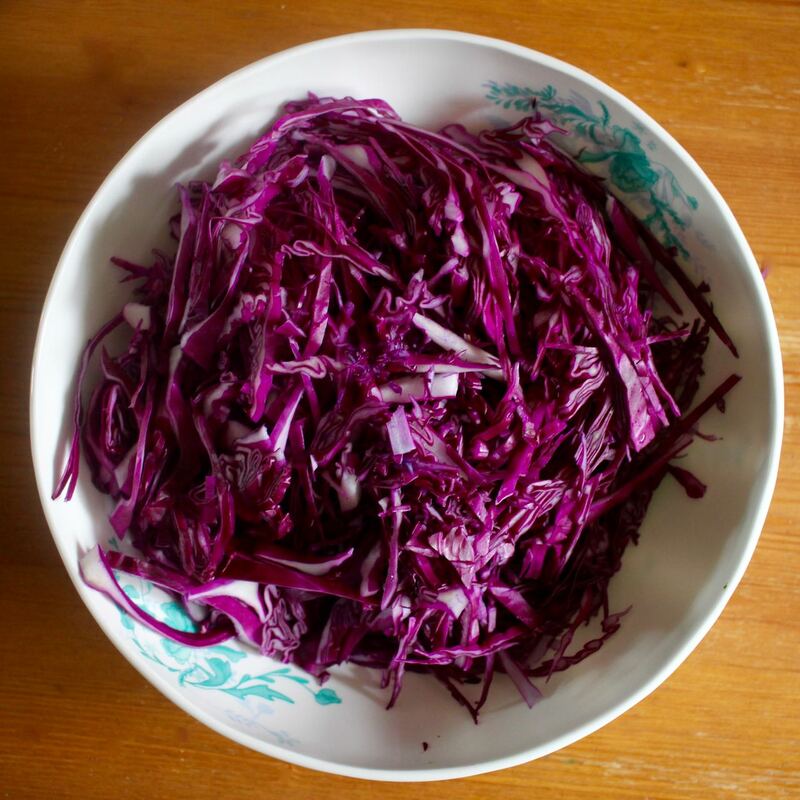 I am going through a purple patch, if that is how I may describe months of purple cabbage always in my fridge and often in my meals. While I often buy cabbage, it is usually the green type and is often in the background of a stew or fried for a side dish. The purple or red cabbage has been featured far more both in salads and sandwiches. It is beautiful to look at and good for you too. 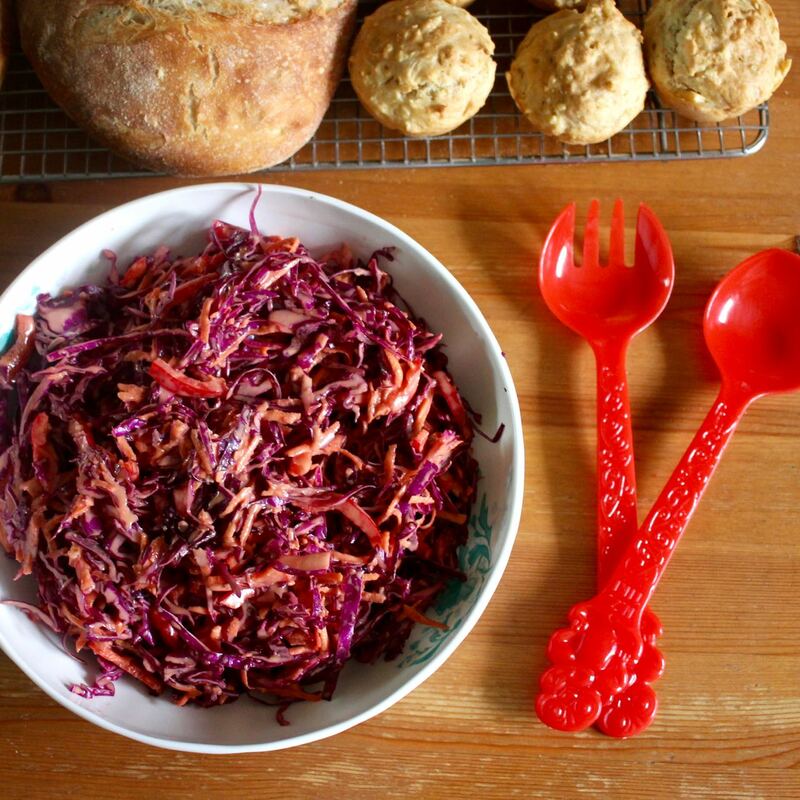 Often I just made some coleslaw as a side dish. 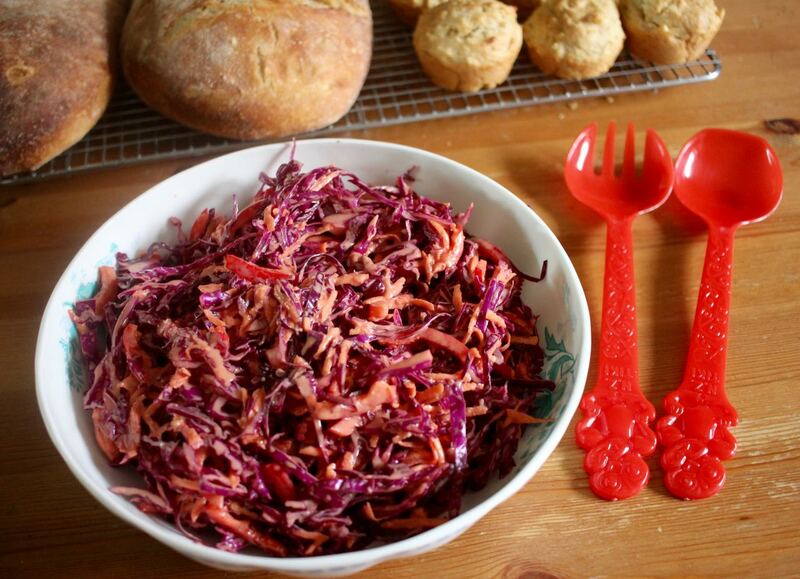 A bottle of coleslaw dressing in the fridge makes this quick and easy. Together with some baby spinach this has often been an easy way of increasing the vegies in our dinner. On the weekend the weather was so rotten that a planned group trip to the Pentridge Festival morphed into a games afternoon at a friend's place. I baked bread and made coleslaw. As I was low on my bottle of dressing, I decided to have a go at making a dressing. As I had vegannaise, I made it vegan. I played around with the flavours until it seemed right. It was a most enjoyable salad. Not terribly sweet but tasty. I love the fresh crunch of the vegies too. Eating a pile of this salad is easy. It went well with the bread, little cheese pastries and dips before we started on the serious business of Scrabble and Uno. I am sending this salad to No Croutons Required and Healthy Vegan Fridays. NOTES: My cabbage weighed about 300g. You can do this with green cabbage but purple cabbage is much prettier. You could slice the vegies with a food processor or mandolin but I find it easier to just use a large chef's knife. You can use a regular mayonnaise - I used Vegannaise which made the salad vegan. I didn't have a spring onion (which I have been using in other coleslaws) so I added 1/2 tsp of dried onion flakes instead. Using the whites of the spring onion keeps the red colour. Lately I have been baking more than I have for a long time. It may be that I have finally recovered from the festive season or just the demands of more hours and more riding to and from work with my new job. Last week I baked 3 batches of muffins. Three! 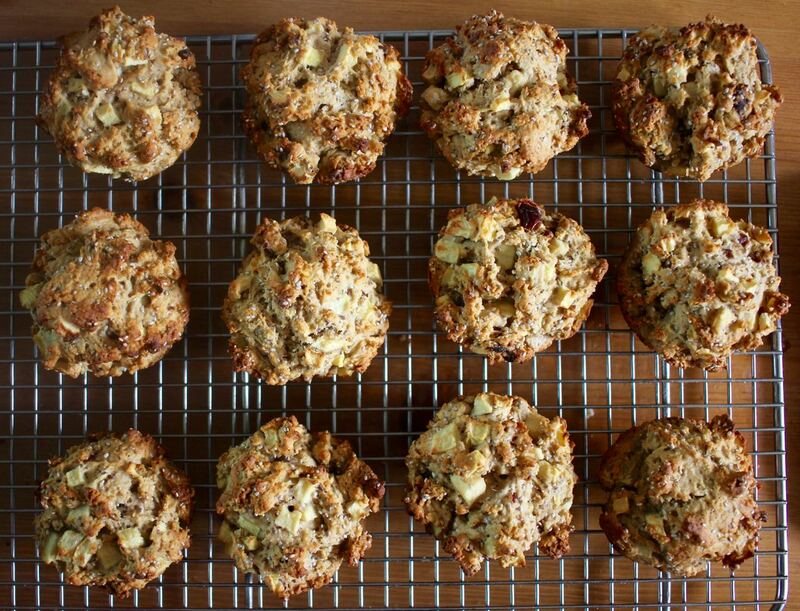 One of these was a batch of apple date and chia seed muffins which were excellent. 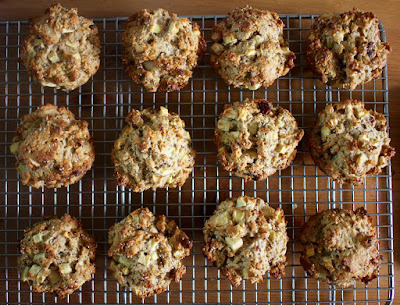 One reason I made the muffins is that it is apple season but all apples are not created equal. Some are crisp and crunchy. Others are mealy and meh. I had a few of the latter to use up and decided on muffins. 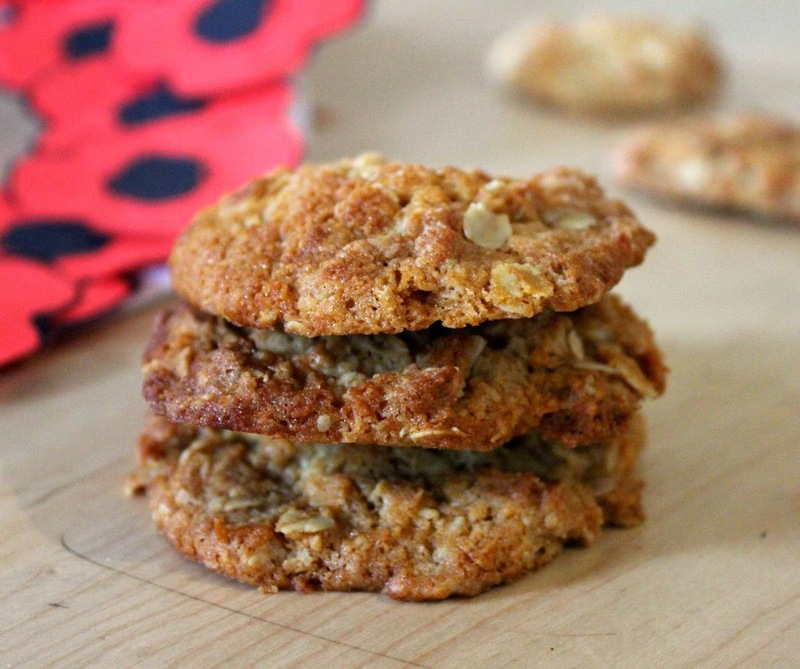 I baked them between coffee with my friend Kathleen and my book club. 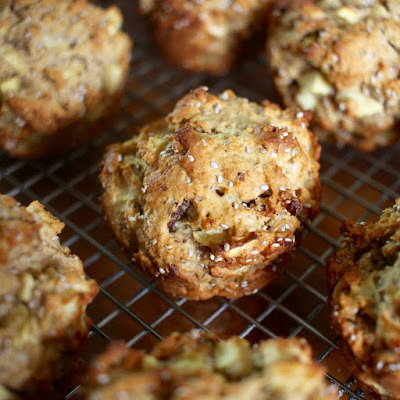 I found an apple and pecan muffin recipe in the Joy of Vegan Baking. I had to work out the recipe to suit my kitchen. No pecans but lots of dates and a vague memory of seeing chia seeds in muffins recently. It was rather peaceful baking them. E was pottering about with his ukulele and secateurs; not both at one, mind you. Sylvia was on the lounge rug sorting out her textas (or markers). She occasionally came over for a piece of apple as I chopped them. There is a great article in the Huffington Post titled "Psychologists explain the benefits of baking for other people". I like that they describe baking as a form of mindfulness. Sometimes it feels like a mad rush and other times it is indeed a relaxing way to slow down. It felt good to bake these muffins. 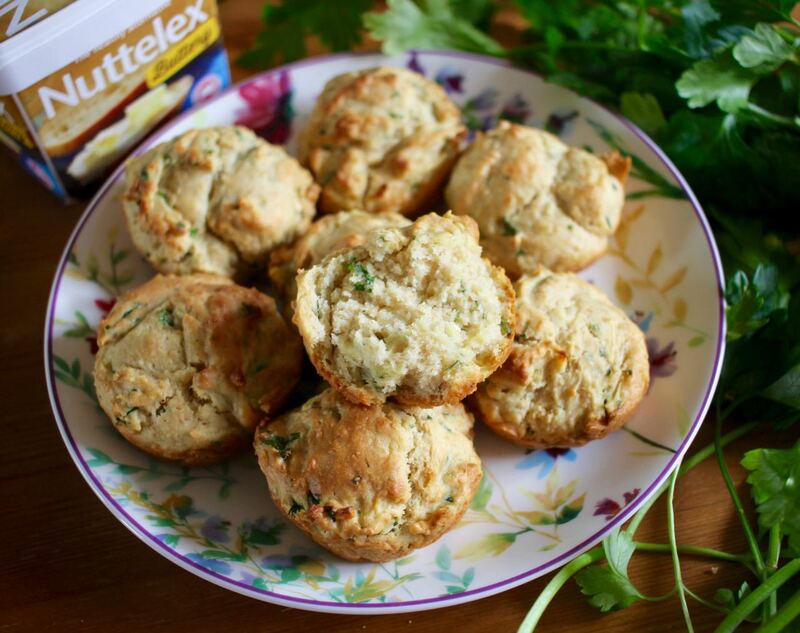 It also felt good to eat these muffins. 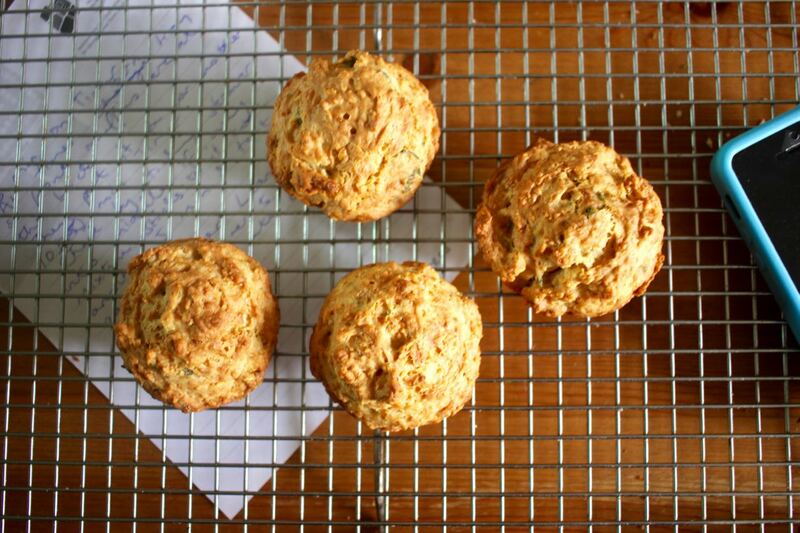 The batter seems incredibly thick but the resulting muffins are lovely and soft. The apples were soft and juicy. The chia seeds gave some interesting texture. They were quite sweet so I might reduce the sugar next time. But they were something I was proud to contribute to book club and a nice work snack. 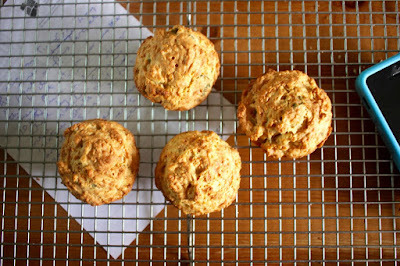 I am sending these muffins to Simple and In Season run by Feeding Boys, and Treat Petite run by the Baking Explorer and Cakeyboi. Preheat oven to 200 C and grease a 12 hole muffin tin. Mix dates, boiling water, maple syrup and ground linseed in a small bowl and set aside. Toss together flours, baking powder, cinnamon and salt in a large bowl. Stir oil, sugar and vanilla into date mixture to make a thick syrupy mixture. Pour into flour mixure and mix until combined. 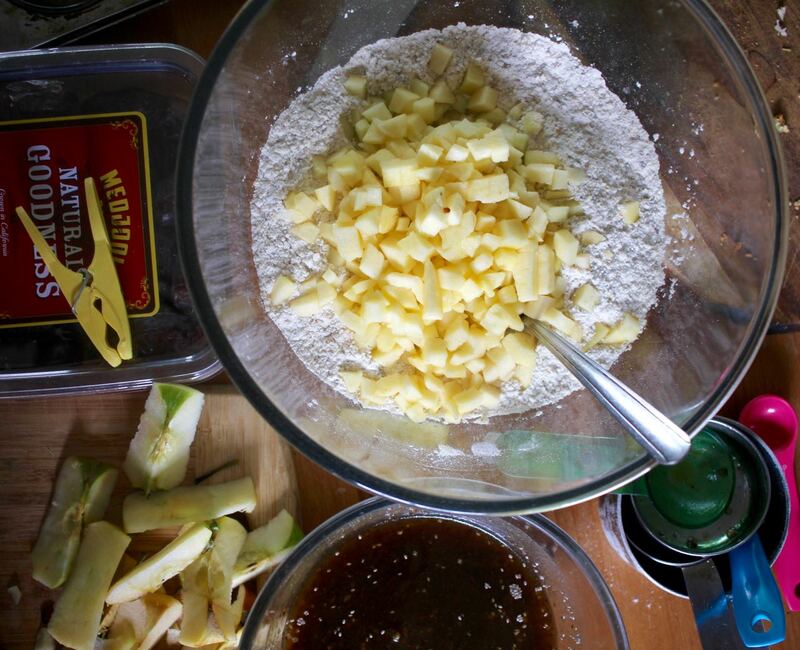 Stir apples and chia seeds into batter. It will be quite stiff but you can add 1-2 tbsp of water if you need to loosen it a little. Spoon batter into muffin cups. Bake for about 20 minutes or until golden brown and a skewer inserted in the middle comes out clean. Cool on a wire rack and keep in an airtight container for about 3 days. I am here today to confirm that if a loaf collapses into a heap of gravelly cauliflower and lentils, is it still every bit as tasty. I can also confirm a truth among loaf makers. Loaves always slice better on the second day. You will probably be nodding sagely at these truths. More controversial is my lack of regard for a recipe. Perhaps if I had followed it more closely I might have found my loaf stuck together better. 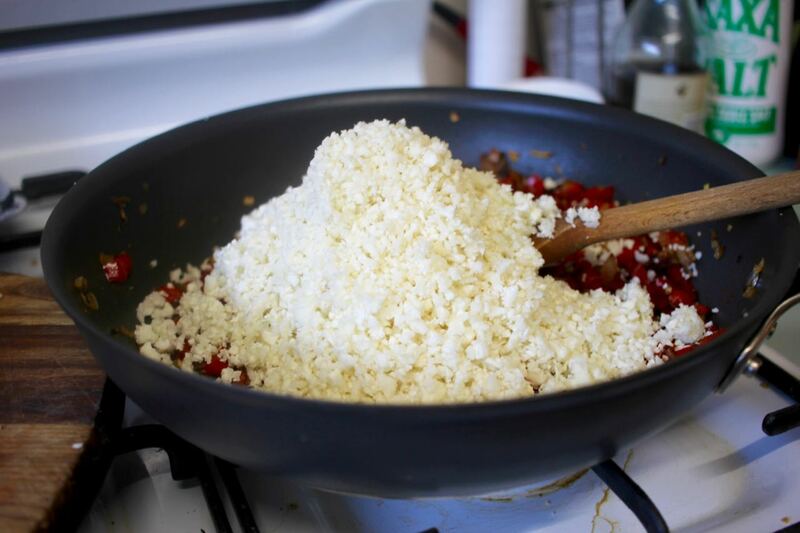 Once all the ingredients were added, the snowy white cauliflower was transformed into a minced meat like mixture. I am reminded a little of this vegan minced meat and would have added finely chopped walnuts if I had any. Instead I put in some ground cashews to try and make it stick together better. I was able to take my time with this loaf because Sylvia was having a sleepover at a friend's place. When it was cooked, I cut slices which collapsed on the plate. It was so late that it was dark. This was just before daylight savings ended so I need to get used to serving dinner without natural light. Not good for blogging! Even last night when I rode home, the sun was an ruby ball of sunset by the time I got home. Collapsing dinner in the dark does not make for attractive photos. Not to mention, making a mockery of baking it in a loaf shape when I could have just fried it up to look like a pile of fancy cauliflower rice. So I have spared you the sight. The second night, Sylvia was home and refusing to eat the loaf. However when I tried to find a quiet moment before dinner (and sunset) to photograph our meal, she was very interested. She helped me find some food props for the photo. Finally on the second night the slices of loaf held together. Mind you they were still fragile. If I hadn't got distracted, I would have tried to squeeze the liquid out of the riced cauliflower. However, more important than whether the loaf held together or not is the taste. It was meaty but didn't leave you with a heavy filling. I serve it with tomato sauce, coleslaw and baby spinach. It was so delicious that I didn't want to wait for dinner and took a few sneaky mouthfuls. I would love this in a wrap or with roast vegies. 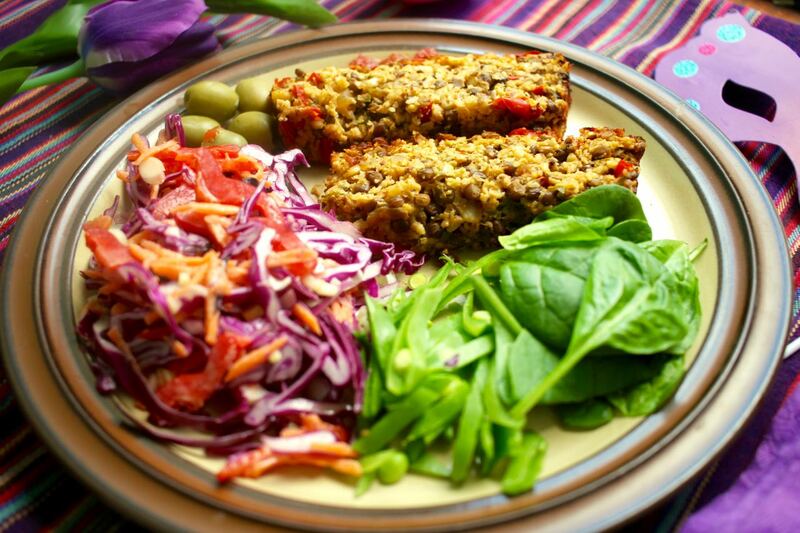 Tasty, healthy and packed with vegies and protein, what's not to love about this loaf. Preheat oven to 200 C. Grease and line a loaf tin. Fry onion, mushrooms, capsicum and garlic over medium heat for 5-10 minutes until softened. * Meanwhile place the riced cauliflower into a clean tea towel, gather the ends together and squeeze out as much liquid as possible. * Add remaining ingredients and stir until well combined. Tip into prepared loaf tin. Press down with back of a spoon. Stir together the sauce and liquid smoke to make glaze. Brush glaze onto the loaf. Bake for 45 minutes. It is easiest to slice the day after baking. *NOTES: I always add my vegies to the frypan as I chop them so I have listed them in the order that I chopped them. 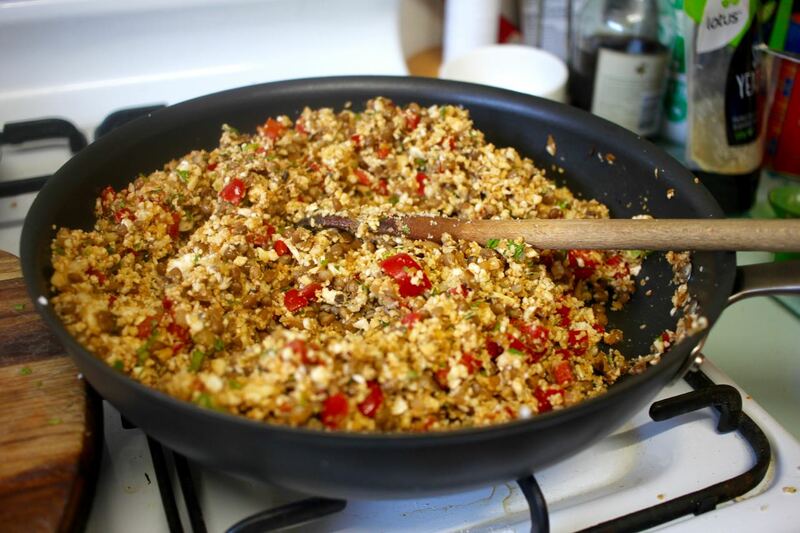 Riced cauliflower is finely chopped to the size of rice grains. I riced my cauliflower in my high power blender. I forgot to squeeze liquid out of the riced cauliflower but I would do when making again as I think it would help it stick together better. I fried my vegies in a large frypan and just added the remaining ingredients to the pan to mix.